announcer: 'please, everyone....put your hands together and welcome your hostesses with the mostest...the guys who live and looooooooove to make people like you happy!!!!! see me, feel me, touch me, heal me, heal me, heal meeeeeeeeeeee! thank you......thank you very much.......we'll be here till midnight, try the shrimp!!!!! They were just enjoying your art. HEY, THESE AREN'T CHOCOLATE SPRiNKLES!!!!! And be sure to tip your waitress! Which one's the Geico one? HAHAHA....yes, don't forget the waitresses! and lumpy's the geico lizzy...that's his day job, and he should KEEP it! stumpy's day job: taxi driver....no tail makes for easy driving! awe, look at those big scalies (do you call them that there too?). yes, i'm sure they were just apprecaited the art. poor no. 2 looks like he lost his tail no? no we don't, but i will now!!! Aw, cute! Are they iguanas? Or something? I like lizards, I want lizards to wander through my yard!! BTW - what area do you guys live in? You're in the greater LA area, right? 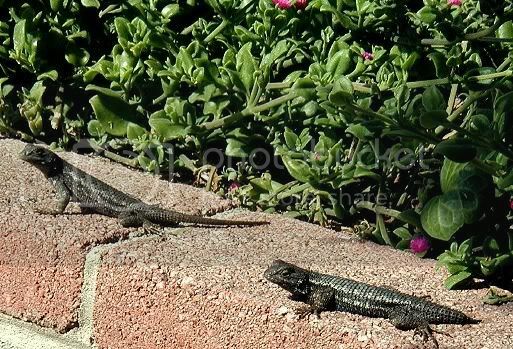 yup, just your everyday, garden variety lizards. i love having them around.. i lived in hawaii for awhile and there were geckos EVERYwhere, even in the shower sometimes! eeeEK. and yes....we're in los angeles. were all those lyrics off the top of your head? the SONGS were off the top of my head....but, i have google to thank for the lyrics.